We are doing the Airport Lines All Wrong Part 2: Where is South Auckland’s Green Line? When I have debates about the Southern Airport Line (Botany to Airport Rapid Transit via Manukau and Puhinui) with others the debate is usually around economics (cost and capacity) and basic environmental stuff (capacity and cars off the road). What I forget (and naughty me in being a Geographer as well) was the deeper environmental impacts between a bus way and a light rail line – that is surface run off of storm water and the possibility of carbon sinks. A busway is basically asphalt from beginning to end – so hard run off. Yes in New Zealand we do storm water gardens for hard surface run off before that said storm water hits the waterways but is that an appropriate response for an existing urban area like Southern Auckland? Light Rail goes further in that the right of way is already green with the only hard surface being the tracks themselves (the sleeps would be under the soil surface). This means each time it rains the storm water is already collected by the green right-of-way, filter and finally peculated before hitting the waterway systems. No need for storm water ponds and flooding also becomes mitigated as well unlike what we would get with bus rapid transit (BRT). Also green is just nicer to look at than grey asphalt especially in an urban area. Each of these trams are running on track where the ballast and related infrastructure allow for grass to grow up. They often allow a type of short grass to grow to provide easy maintenance. With all that… I rest my case on light rail and trams. Either you make wise decisions or you just regress or slow the progress and development of your city. Don't rely solely on buses, and whatever you do don't leave your city auto-dependent. The later will starve it of life. If anybody is curious about where those last couple tram/light rail related threads came from it was the unambigious absurdity following these comments of this thread https://t.co/2Qk4yBBG0R where Nashville is trying to grow in a non-stupid way but is probably destined to anyway. That at more than 5x the capacity of a 2 lane highway with barely any noise level I'll take any day! Which on a number of them, it is. Also simply, if one doesn't want to spend the money on a paved road or the respective maintenance and pollution. These are great alternatives. 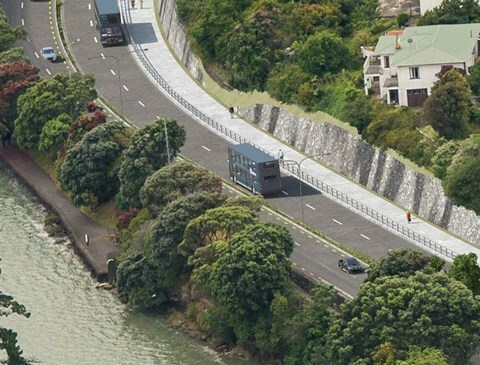 If the Isthmus (Central Auckland) is to get Light Rail for the Northern Airport Line and no doubt a green LRT line at that (Dominion Road) then why does Southern Auckland get stuck with a noisy bus rapid transit system that has consequences of amplified noise (bus, and asphalt reflecting the noise) and mass storm water run off from the asphalt? As it was pointed out to me Southern Auckland also houses four of the five heavy industrial complexes meaning hard surface area is higher – thus run off is higher. The Southern Airport Line runs through two of the complexes so adding some green would mitigate that run off. A green transit line for the SAirL would also act as a carbon sink for the industrial South as well rather than as a carbon emitter as we would otherwise get if the line was BRT. Also is Southern Auckland not allowed a green transit line like the Isthmus is – especially as the Southern Airport Line if your first transit line you catch heading to either the City Centre or south of Auckland? I personally think that it is a bit stink the Isthmus gets a green transit line than the more populous South. Just because we have industry and social deprivation does not mean we can not have a green transit line either. Noise reduction, storm water absorbent, carbon sink, amenity provider – this is what a green transit line would provide compared to the sea of asphalt a bus way would give in an otherwise highly built up area. As for cost? Yes Light Rail costs more than Busways in pure dollar terms but in full social and environmental terms green LRT wins out. Especially when the Line traverses industrial areas or highly built up areas like a large Metropolitan Centre such as Manukau. Me too Ben BUT it’s because of the South’s industry and burgeoning population that it’s so important a green line be built. The amount of pollutants collected from roadways is phenomenal. Anything that reduces the impact has to be a points winner.